I have one or two 7 O'Clock razors and they are each open comb, but as part of a bit of a junk haul recently, there was a closed comb version with the Gillette thin handle. I have no reason to believe that the handle didn't go with the baseplate and cap. It's all a bit tarnished, condition 'fair'. There was an entire age of gunk build up shared on all components, and the scratches on the underside of the baseplate matched where the handle goes on. 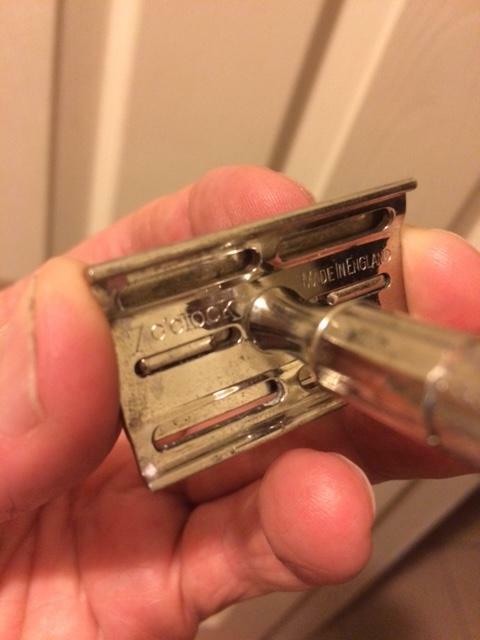 I have never seen such a razor or an image of such a razor, and was just wondering if anyone has an example of a closed comb 7 O'Clock...with any kind of handle? I don't think it's a Frankenrazor, either. It seems somehow right. I think it's essentially identical to the British-made flat-bottom Tech. I've seen the head for sure and think it's more like the US made Techs as it's stamped sheet metal whereas the hybrid was a thicker, cast design. From what I can see, the handle is the knurled Gillette Tech handle (a good one). So, might it be a franken type combo. A good shaver in any case! Texbilly, the open comb equivalent of the Hybrid Tech is the Raised Flat Bottom NEW (RFB NEW) (or, rather, it's the other way around). The razor in the photo is the closed comb version of the 7 o'clock razor; most of those were called Techs. Now we call them "flat-bottom Techs." The head of the razor in the original post is almost certainly essentially identical to the flat-bottom Tech. The razor in the OP's post is not rare, but it's not particularly common, either. It should be a good shaver. Yes, it is certainly almost identical to the English flat-bottom Tech, but I have never seen a closed-comb version of the 7 O'Clock. As also mentioned, yes, it is a thin-handle Tech handle, but the marks indicate it was always the handle that came with this 7 O'Clock head. I think it isn't a Frankenrazor, though you would think so. I was interested to know if anyone has ever seen the same 7 O'Clock baseplate? If so, is there a photo? I feel like I've seen one before, as part of a discussion on another forum, but I can't swear to it. They made open-comb Techs, so they probably made closed comb 7 o'clocks. Neither is common, though. Mr-Razor have a picture of a closed-comb 7 o'clock in his collection, although made in India and not with the flat bottom. (03-13-2017, 12:52 PM)kingfisher Wrote: I feel like I've seen one before, as part of a discussion on another forum, but I can't swear to it. They made open-comb Techs, so they probably made closed comb 7 o'clocks. Neither is common, though. True enough, but the open comb version is relative easy to find - images on the net are available. Closed? Zilch. I think the closed comb version must be very rare indeed. The Indian version doesn't resemble what I am talking about at all and is a relatively modern addition (1998) to what I think is representative of the diminution of quality (and beauty) of Gillette razors overall. I have now written to Achim (Mr Razor) to see if he has any knowledge of this enigmatic little specimen. I will keep you posted. I had a reply from Achim, AKA Mr Razor. Nope; he's never seen a closed comb 7 O'Clock. Interesting. Very interesting. I explained that it had a thin handle tech handle, and it 'seemed right" to him. So, a new discovery. Must be pretty uncommon if Achim hasn't seen one.